Kewanee, located in west central Illinois, was formed along the railroad tracks in the early 1850s. Today, Kewanee is still a railroad community, and that original railroad track has now become one of the nation�s major eastwest routes. Amtrak operates a passenger line that stops in Kewanee on its way to and from Chicago both morning and evening. More modern forms of transportation are available. 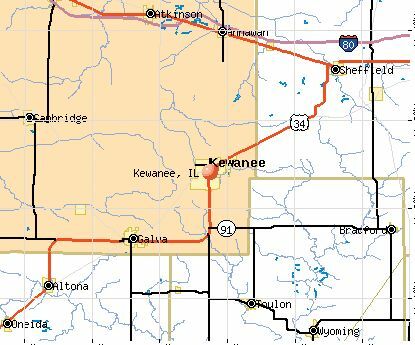 Kewanee is just 10 minutes south of Interstate 80 which runs from New York City to San Francisco. to the south is Interstate 74, which connects us with points south and east as far as Cincinnati, Ohio. Route 34, a federal highway that connects Chicago with the West, runs through Kewanee, Illinois Route 78, one of the state�s longest highways, which runs from the Wisconsin border south to Jacksonville, runs through Kewanee�s main business areas. The Kewanee Municipal Airport, three miles from the city on Midland Road, has a 4,500-foot east-west paved runway and a 3,200-foot north-south pave runway. A number of Kewanee�s manufacturing and retail businesses regularly take advantage of this facility. There are some 2,400 takeoffs and landings each year at the airport, one of the finest in downstate Illinois. Less than an hour�s drive away from Kewanee are airports in the Quad Cities and Peoria which offer an additional and international air service, and Chicago�s O�Hare International Airport is under three hours away. Kewanee�s location is an advantage. We�re less that an hour from the Quad Cities, Galesburg, Peoria and LaSalle-Peru, and Chicago is less than three hours away. St. Louis is within a four-hour drive.